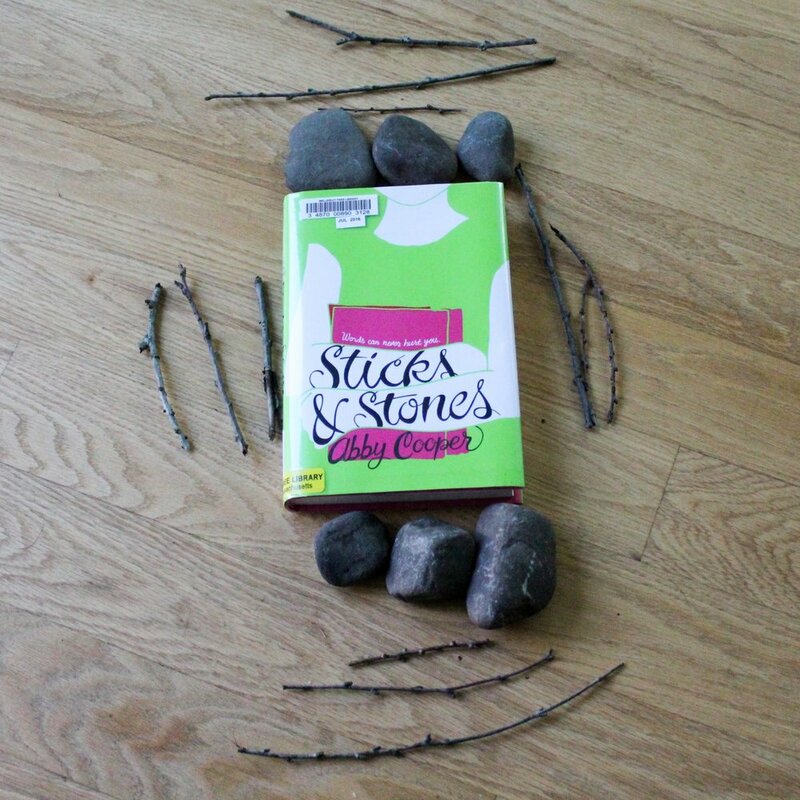 Sticks and Stones by Abby Cooper is about a girl named Elyse who has CAV, a disorder that makes the names she is called appear on her body. The mean words itch. In elementary school everyone thought CAV was cool but starting in middle school the condition gets worse because mean words increase and nice words decrease. The book is about how she deals with her problems and ultimately succeeds. 1. Where did you find the book? I found this book at the library. 2. What did you love about the book? I loved how Elyse pushed through CAV and didn't let it stop her from achieving her goals. 3. What turned you off about the book? I did not like that Elyse never told Jenny (Jeg) how Liam schemed to become her boyfriend. 4. What is your favorite quote from the book? “Words can never hurt you." 5. Who was your favorite character and why? My favorite character was Olivia because her feelings toward Elyse did not change when she found out that Elyse had CAV. 7. If you could have dinner with the author, what would you ask him/her? Did you enjoy writing the book? 8. What scene did you love most? I loved Jeg's party, where every room was a different country, especially when Elyse and Olivia visited the United States room and pretended to surf while singing "Surfin' in the USA." Lily and Dunkin by Donna Gephart is about two boys, one who wishes he were a girl and one who has bipolar disorder. They want to be friends but wonder if they can tell their secrets without scaring the other one away. 1. Where did you find the book? I received ten books for my 10th birthday and this was one of them. 2. What did you love about the book? I loved that the book included some really deep secrets. 3. What turned you off about the book? That Dunkin never told Lily about his disorder. 5. Who was your favorite character and why? My favorite character was Lily because she knew what she wanted and never gave up. 6. George R. R. Martin famously said that “a reader lives a thousand lives before he dies.” What about this book’s life do you want more of in your own life? I want to be more like Lily who is strong, persistent and kind. 7. If you could have dinner with the author, what would you ask him/her? What is your favorite part of the book? 8. Who would play the lead characters in a movie based on this book? Reese Witherspoon would play Lily and Brad Pitt would play Dunkin. 9. What are you reading next? I am listening to the audiobook Nooks and Crannies by Jessica Lawson next. The Witches by Roald Dahl is about a boy who encounters witches. Twice. The first time he was lucky. The second time not so lucky. So he seeks revenge. 1. Where did you find the book? My Aunt Lindsay gave it to me because she thought I'd like it and I did. 2. What did you love about the book? I loved the witches most of all. 3. What turned you off about the book? The boy's father's will requested that the boy live in England but he ended up in Norway, and that confused me. 5. Who was your favorite character and why? The Grand High Witch of All the World, because instead of saying witches she says vitches and that always made me laugh. 6. George R. R. Martin famously said that “a reader lives a thousand lives before he dies.” What about this book’s life do you want more of in your own life? Nothing! I am glad I have none of this book's life in my life but it was fun to visit that world for a little bit. 7. If you could have dinner with the author, what would you ask him/her? Who or what inspired The Grand High Witch character? 8. Who would play the lead characters in a movie based on this book? Meryl Streep would play the grandmother and Ty Simpkins would play the boy. 9. What are you reading next? Lily and Dunkin by Donna Gephart. Storm Horse by Nick Garlick is about a boy named Flip whose mom left when he was young. Then his dad dies so Flip has to move in with his scary uncle. Within his first few days in Mossum, a storm rolls in and Flip sees a horse who is about to drown. Flip saves the horse and names it Storm. This book is about their friendship and inseparable bond. 1. Where did you find the book? At the library. 2. What did you love about the book? I loved that the book included horses. 3. What turned you off about the book? I did not like that the name of the horse was so obvious. 4. What is your favorite quote from the book? "Fool me once shame on you. Fool me twice, shame on me." 5. Who was your favorite character and why? Mr. Bouten because he was so nice to Flip when he first moved to town. 6. George R. R. Martin famously said that “a reader lives a thousand lives before he dies.” What about this book’s life do you want more of in your own life? I would love to live on a farm and own a horse. 7. If you could have dinner with the author, what would you ask him/her? I would ask him how he came up with the idea for this book. 8. Who would play the lead characters in a movie based on this book? Josh Hutchinson would play Flip and Emma Watson would play Flip's cousin Renske. 9. What are you reading next? I don't know. I have about 30 books to choose from. Mango Shaped Space by Wendy Mass is about a girl named Mia who has a cat named Mango and a big secret: numbers, sounds and letters all have color for her. 1. Where did you find the book? I received it as a birthday gift. 2. What did you love about the book? How numbers and sounds and letters all had color for Mia. How cool. 3. What turned you off about the book? Nothing really. I loved every minute of it. 5. Who was your favorite character and why? Mia, because she was really brave when the whole school found out about her unique condition. 6. George R. R. Martin famously said that “a reader lives a thousand lives before he dies.” What about this book’s life do you want more of in your own life? I want to adopt a cat or save an animal. 7. If you could have dinner with the author, what would you ask him/her? How did you assign the colors to each of the letters and sounds? 8. Who would play the lead character in a movie based on this book? Jennifer Lawrence would play Mia.